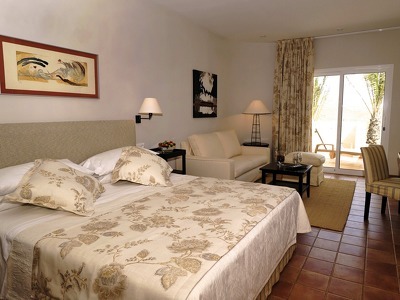 There are 12 rooms and suites spread across the hotel, most with private terraces and their own entrances. Bathrooms are modern and beds are comfortable - some rooms even come with Jacuzzi's. 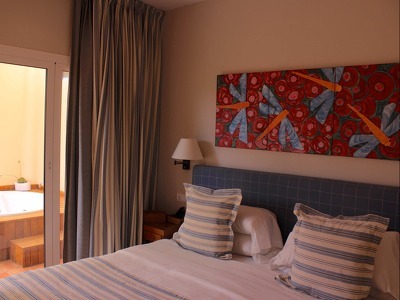 The majority of rooms also have sensational views of the bay and mountains. All the Junior Suites have private entrances from lush, outdoor pathways. 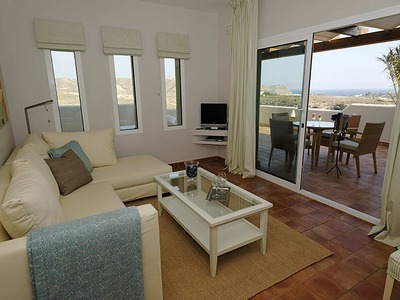 They all have large, private terraces with sunbeds and an outdoor seating area with chairs and a small table where you can enjoy views of the Agua Amarga bay and the mountains. The Junior Suites are bright and airy. In addition to the facilities on the outside terrace, which connects directly to the suite, the Junior Suites also have an indoor seating area. The Suites have private entrances from lush, outdoor pathways. They all have a large, private terrace with sunbeds and an outdoor seating area with chairs and a small table where you can enjoy the great views of the Agua Amarga village, the sea and the mountains. 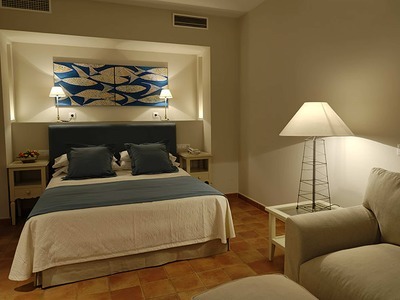 The Suites are spacious and have an elegant and natural design that harmonizes with the surrounding nature. They all have Jacuzzis and a separate indoor seating area that connects directly to the large and intimate outside terrace with unrestricted sea and mountain views. With its private access and parking, its prestigious entrance area and its secluded and majestic corner position, the Suite Deluxe offers total privacy with breath-taking views; including a 2000 year old olive tree in the rambla below. The Suite Deluxe has an indoor covered patio with Jacuzzi for 2. The large and partially covered terraces have sunbeds and an outdoor seating area with chairs and a small table. On the upper terrace there is also an intimate and comfortable lounge area with a corner sofa for relaxation and cocktails. Evenings on the terrace are magical. The elegant Double Superior Rooms have private entrances with handcrafted iron doors and an intimate outdoor patio with Jacuzzi. They are the only rooms at Real La Joya without terraces facing the sea, but via a staircase from the patio, there is a private roof terrace solarium with spectacular views of the Agua Amarga bay, the surrounding mountains and the valley of the Viruegas with its impressive fruit tree plantations. Set in the Cabo de Gata Nature Reserve, Real Agua Amarga’s jaw-dropping surroundings are certainly a sight to behold. From the towering palms and verdant greenery, to the undulating hills on the horizon - the views here are spectacular. However, it’s not just the scenery that makes this Chic Retreat so aesthetically pleasing - step inside its whitewashed walls and you’ll find vibrant artwork, cosy furnishings and characterful terracotta floors. Given the hotel’s countryside setting, you can expect some serious peace and quiet time here. Whether it’s lounging by the pool, a trip to the beach or simply taking in those beautiful vistas, this countryside getaway is the perfect spot to recharge your batteries. Please note that this is an adult-only boutique hotel and therefore is only suitable for those 12 years and older. Be it a dip in the crystalline outdoor pool or a stint in the hot tub, Real Agua Amarga is kitted out with all you need to ensure you don’t leave unrelaxed. It gets better too: a range of wellness treatments and massages are available (please book ahead of time), so you can enjoy some well-deserved TLC. Aside from all that pampering, there’s much to keep you occupied here. Art exhibitions are held regularly at the hotel, there are plenty of hiking trails to make use of and a glittering stretch of golden shoreline is just a 5-minute drive away. Start your day with a great breakfast, which can be enjoyed on the terrace in fair weather. Come dinner time, the hotel restaurant serves up some delicious Mediterranean and International dishes, all of which are made using local produce where possible (it’s worth noting that the restaurant is not open every day of the week). We would recommend hiring a car to get here and around. 50% Deposit is due at the time of booking and the balance to be paid at check out. If cancellations are made 14 days before check in the 50% deposit will not be refunded. Check in from 13h30 to 15h00 and from 17h00 to 21h30. Lugar con encanto en el parque natural de Cabo de Gata, provincia de Almería. Localidad Agua Amarga. Tranquilidad ,confort, calidad en el servicio y en la restauración. Relación Calidad precio excelente. We spent 8 days and nights at this lovely und extraordinary place and we really have to say that it exceeded all our expectations by far. Starting with the team – lead by the wonderful Isabel! It seemed that they anticipated all our wishes and we were overwhelmed by their hospitality. Every morning started with a breakfast by the pool which we will miss for a long time. There was plenty of fresh fruits, eggs cooked the way you want them, fresh orange juice, little Tapas …. name it all…! The evening dinner was so delicious, that we didn´t make it to the local restaurants. On the day we left, we had to check out so early, that we missed breakfast and of course we had a breakfast basket decorated and filled with everything we would need for our trip home – unbelievable! The Room, the big pool and the whole place is clean and very tasteful and lovely decorated. If you take a walk around you will pass a beautiful landscape and you usually end up at a beach with crystal clear blue water, which is almost as empty as the rest of this part of Spain. This place is simply magic!!! We finally want to say thank you to the whole team for an unforgettable stay and we are coming back for sure!